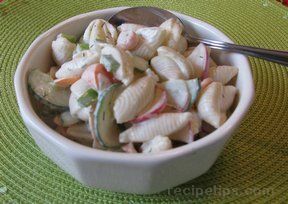 Pasta salad recipe loaded with vegetables. Cook pasta according to directions. Drain. 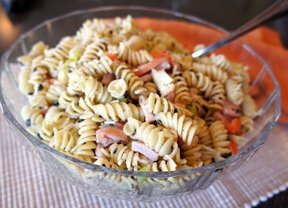 Combine pasta and vegetables in a large bowl. In a small bowl, combine mayo, sugar, dill weed and vinegar. Pour over vegetables and stir until combined. Chill for at least 2 hours. 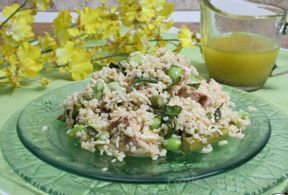 "I doubled the dressing on this salad as well. I had great responses from the party I took it to." "This is a very good salad. 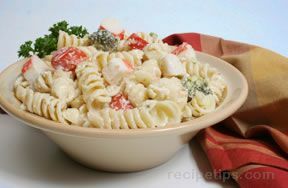 I found that I needed to at least double the amount of dressing and I used midium shells instead of large ones."